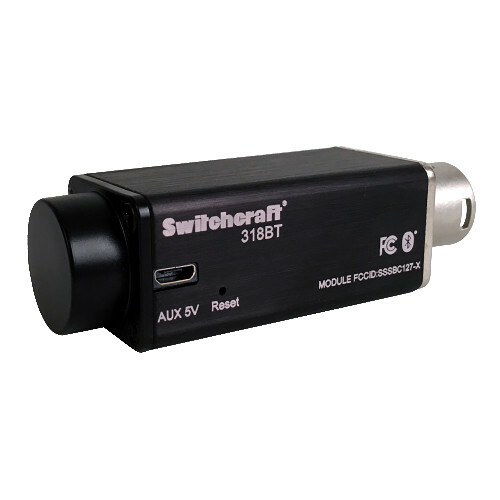 The 318BT from Switchcraft is a small, in-line wireless audio receiver that makes it quick and simple to pair mobile devices to your audio gear. It utilizes 4.0 Bluetooth technology to stream audio from any Bluetooth-enabled device straight to your mixer or audio console with low latency, and at a distance up to 100'. The unit utilizes 48V phantom power, but can be powered from an external source via the micro-USB port when phantom power is unavailable. The 16-bit DAC delivers a high-quality audio signal with its output summed to mono (balanced). Made in the USA and featuring a durable, anodized-aluminum enclosure with a Switchcraft XLR connector, the 318BT is built to withstand the rigors of commercial and residential environments. Box Dimensions (LxWxH) 6.7 x 2.3 x 2.3"
318BT Phantom-Powered Bluetooth Audio Receiver is rated 4.3 out of 5 by 6. Rated 5 out of 5 by Anonymous from Excellent device, gets the job done very elegantly Bought this device to test it out and very impressed with performance, buying 5 more as gifts. The device paired up quickly and effortlessly to my iPhone and gave great range. Only drawback I could see was output level, it is determined by setting volume on connected device, so you have to raise the volume on you playback device in order to get a higher level at the XLR output. Rated 2 out of 5 by Jarib from For the price... When used with a Yamaha TF5 mixing console, the phantom power causes a continous peaking on the channel for 5-45 minutes after power up. I returned the first unit thinking it was bad, but the second unit does the same thing. Other units like this are more expensive, so I plugged in the 5v usb power on the aux port and it seems to work fine. I feel like I should get half of my money back since only half of the power ports work as advertised. Otherwise, sound is great and easy to connect to. It is a real bonus for the worship team! Rated 5 out of 5 by Anonymous from Works like advertised...and well! Just plug it into an XLR jack on a mixer and turn on Phantom Power on the mixer to power it, and it connects to any device I have, very quickly. Not stereo. It has a power supply jack on the side of it, in case your mixer or connection doesn't have Phantom Power. Rated 5 out of 5 by Anonymous from I would buy this product again. I have not yet used this at an event, but I have tested it at home and it seems to work fine. Rated 5 out of 5 by Anonymous from I would buy this product again. Great product. Easy trouble free connection to bluetooth tracks on my tablet. Can I pair two of these (one on each speaker) to one transmitting signal? Answered by: CHIUNG HEISN C.